In a bomb-explosion designed and executed by Emperor Haile Sellasse’s regime at the Cinema Ampere in Addis Ababa (22/10/1967) some 36 people were wounded. The purpose of this machination was to accuse the leadership of the Macca-Tuulama Association, but more particularly Maammoo Mazamir, of masterminding the bombing. In the morning of November 22 Maammoo was arrested and thrown to jail. He was later accused of what he never knew, and in fact without any witness, sentenced to death. 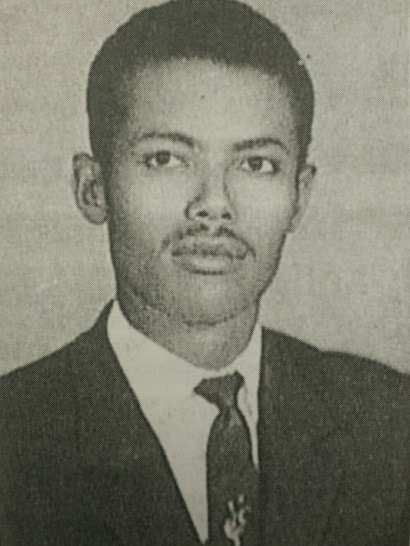 Maammoo Mazamir was in 1970 hanged at the ‘Ethiopian’ prison of Alem-Beqqagn. But before he was taken up in imperial Ethiopia’s murderous rope, he uttered about his deep intentions, stated in almost a prophetic designation that his martyrdom would be counted as a price paid for his people’s demand for self-rule and that taking his life for such a cause is only a start, ‘Oromo children’ were as yet to be sacrificed, “My blood,” Maammoo said, “ is not shed in vain, it is a blood paid to achieve the Oromo people’s right [for self-rule]. The Oromo nation inevitably achieves its rights through [the price paid in] my blood and of numerous other Oromo children as yet to be sacrificed, they accused me of what I have never done. The Emperor and his Ministers certainly will receive similar judgement from the Ethiopian peoples not so long after this” (Olana Zoga, 1985 EC:428). Mammo committed no crime, neither did he knew anything related to civilian bombing at Cinema Ampere. If there was only one thing he lived and died for it was Oromoness. As an active member of the Macca-Tuulama Association he stood for Oromoness and along with his fellow Oromo colleagues rejected the age-old Ethiopia’s colonial policy of exploitation, and ethno-cultural invasion, suppression and subjugation. The Emperor seems to have feared sentencing all of those who were involved in the making of the Association, it would have been definitely catastrophic. The historian of the Association describes the nature of Association as “a government built within another government.” Yet in the eyes of the imperial regime leaving them all free would not be profitable and would possibly encourage more defiance, all of them were accused received varying degree of sentences. Maammoo was in many ways a martyrdom chosen to shock Oromoness and all of what it meant. Maammoo’s death did not provoke any immediate popular movement. It seemed to many that this young man’s death was in vain. Maammoo indeed died as the Emperor and his cohorts wished him to, but Oromoness and Oromo national struggle did not. Little could imperial Ethiopia understood that it could not achieve death of Oromoness by killing Maammoo, or Haila-Mariam Gammadaa as it soon happened in a more mysterious way. Little could the imperial regime comprehend who Maammoo represented, and thus unable to foresee that by hanging him they were in fact propagating his cause. The regime murdered Maammoo but in few decades time were born ‘millions of Maammoo.’ By shocking the Oromo nation they did not know that they planted bitter seeds of political career where peoples in Ethiopia would treat each other in mutual mistrust. The monarchy did go in exactly the same way Maammoo had prophesied but its successor, the Darg, that led the whole country into bloody struggles and civil wars chose to follow much the same policy on matters of the Oromo nation. Almost needless to say it here the Oromo nation was one of those who happily agreed to principles of multi-national federalism that had reversed policies and ideological orientations pursued by the imperial and the Darg regimes. Four and half decades on, Ethiopian state does not seem to be better in comprehending lasting consequences of politically motivated accusation on individuals or group of individuals prominent among their own people, particularly those who embrace Oromoness. There is an outstandingly clear chain of succession linking “Oromo children,” between the death of Maammoo in 1970 and those dying and suffering today in their homeland Oromia— Oromummaa/Oromoness. They lived under different regimes and were of different generations but the atrocities they received from the Ethiopian state have been the result of how the state chose to treat Oromoness. It would have been surprising if succeeding Oromo politicians have not organized their careers on the foundations of Oromoness. This year (2016) is not 1970. We are now at a time when a single issue of what Ethiopia’s regime called “Addis Ababa Integrated Development Master Plan” evoked Oromia wide Oromo popular movement surviving five months of bloody and deadly crackdown. Oromoness is at its zenith, an attack on central Oromia is perceived altogether as an attack on Oromoness. All of “Oromo children,” to use a translation of Maammoo’s phraseology, who have been imprisoned, cowed to concentration camps, raped, wounded and murdered in connection with the on-going Oromo movement have been registered in the minds of their people as those who sacrificed themselves for Oromoness. They have been praised day and night. Despite their humiliation in the hands of the ruling regime, their respect in the eyes of the Oromo nation has been accelerated. Like Maammoo’s accusations in 1967, the 22 Oromo politicians and the 20 Oromo students accused today (22/04/16) did not commit any of the accusations with which they were charged. The fact that all of them are innocent is clear in the minds and hearts of their people. But the latter are aware of the reason why 22 Oromo politicians and 20 students are accused in Ethiopia’s courts today, it is because of their Oromoness. By assembling from all over Oromia, in the name of arrest and accusation, the regime has formed a political nucleus that best represented the Oromo people in court. Charging this political nucleus with whatever form of accusation is, like it was with Maammoo Mazammir, much more beneficial for the Oromo nation than it will be for the ruling regime. By charging in court a political nucleus whose ideological foundation and public image are based on Oromoness and whose deep yearnings are the achievement of the political demands of Oromia, Ethiopia’s incumbent regime charged Oromo national identity not only as a treasonable crime but also as an act of terrorism. In this sense, the TPLF/EPRDF regime’s accusation of this Oromo political nucleus with the charge of “terrorism” and 20 Oromo students with “criminal” charges today Friday 22 April 2016 is already taken as charges on Oromoness. This same day Ethiopia did no accuse 22 plus 20, it is only one, and i.e. Oromoness–an identity mark of its single largest ethno-nation.